I have been fortunate in my life to be surrounded by intelligent, competent, and fierce women. My mother is a CPA and was the first female partner at a national accounting firm in the city of Pittsburgh. My grandmother was a nurse. Two of my aunts are nurses. I was able to go to an excellent all girls school growing up where everyone - from the teachers, to the receptionist, to my classmates and teammates - were examples of the varied things that women can aspire to and achieve. Growing up, I also had the opportunity to play numerous sports, both at school and outside of school. I excelled at some and learned how to be a leader. At others, I learned the importance of knowing and playing my role on the team. In all, I met and became friends with people with different backgrounds, skills, and interests. 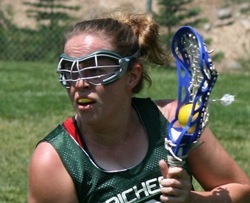 Still today, I am lucky to be able to play on a lacrosse team, where I am able to play a sport I love with excellent friends and talented women, who, off the field, enrich me about their wide ranging and non-lawyer professions - graphic design, marketing, civil engineering, rocket science, writing, producing, and so on. At JMBM too, I have been part of a team, learning and fulfilling various roles, and, eventually, taking the lead. I am lucky to work with and learn from great colleagues and mentors. But more importantly, I am lucky to work with women I consider excellent friends.